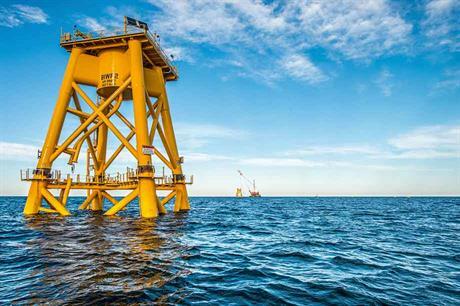 UNITED STATES: Some predict that the US will have installed 1GW offshore by 2020, but even that will be slower than the industry had hoped, a familiar story for offshore developers. By 2020, the first offshore wind project in the US - Deepwater Wind's 30MW Block Island - should have been operating for three to four years, proving to America that "steel in the water" works. But the coming four to five years will still be crucial for the country's nascent offshore wind sector as developers vie to jump-start major projects and demonstration pilots seek to advance technology. The industry will not proceed as fast as hoped, a familiar story for offshore developers. The US Department of Energy (DOE), in its 2015 Wind Vision report, foresaw 3GW of offshore wind installed by 2020, a goal that will almost certainly be missed. About 1GW may be operating or under construction by 2020, almost all in the north-eastern US and northern mid-Atlantic, where power costs are high and onshore sites more limited. Conditions off Massachusetts are similar to the North Sea. Walt Musial, offshore wind manager at the DOE's National Renewable Energy Laboratory, admits the 3GW figure is more likely to be capacity at the final investment decision stage in 2020 rather than online, and Bruce Hamilton, energy director at consultancy Navigant, projects 1GW operating offshore by 2020. One large offshore project completed or under construction by 2020 is more likely, says Amy Grace of Bloomberg New Energy Finance (BNEF), suggesting US Wind's 500MW Maryland project as a possible candidate. The subsidiary of Italy's Renexia has submitted the first 250MW phase to the state's Public Service Commission for possible offshore renewable energy credits, available under the most advanced state legislation for offshore wind in the US. By 2020, a power purchase agreement may also have been signed for a project off New York, says Grace. Make Consulting expects three DOE-funded demonstration projects to advance by 2020, says the firm's Dan Shreve. They are: the 12MW Dominion Virginia Power's Virginia Offshore Wind Technology Advancement Project (VOWTAP); Aqua Ventus 1, a 12MW pilot by DeepCwind off Maine; and the fresh-water 27MW Icebreaker, by Lake Erie Energy Development. But another analyst said: "We need to spend 'political capital' to build up the pipeline, not demo projects. Yes, they are important - they allow technology to advance - but the (small) size just ramps up the cost." Indeed, Fishermen's Atlantic City project, off New Jersey, has faced regulatory intransigence due to cost concerns. VOWTAP has been re-bid because of a high cost estimate. And Principle Power's Windfloat Pacific, off Oregon, has failed to secure an offtake agreement and may be moved to California. All are backed by DOE. Despite the demonstration projects, in 2020 much of the US's offshore technology and know-how will still be European in origin. A North American supply chain will need at least 3GW of local demand to flourish. Thus, state-of-the-art 6-8MW nacelles and blades will be imported, although some components will be local. Last year, Block Island's five jacket foundations were made in the Gulf of Mexico, taking advantage of offshore oil and gas expertise. And domestic manufacturers of towers could scale up their product by 2020. More policy support is needed in the near to medium term to help a robust offshore sector develop, stresses Chris Willow, a senior associate at technical consultancy BVG Associates. Several analysts point to the Haddad bill, in the works in Massachusetts, which would include a requirement that utilities solicit offshore wind. Even so, major offshore developers have arrived in the US. Market leader Dong Energy and OffshoreMW (affiliated with Germany's WindMW, which developed Meerwind), are setting up offices and planning projects off Massachusetts. EMI reportedly hopes to resubmit the stalled Cape Wind project if the Haddad bill becomes law. And Deepwater Wind is actively trying to start two projects off the north-east coast. "It's going to be an exciting five years"